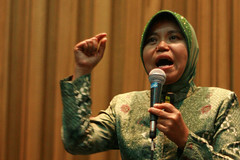 Tri Mumpuni speaks at 4th TEDxJakarta. Tri has helped countless number of villages in being electricity-independent by building community-based micro hydroelectric power plants. Her ultimate goal is for this self-sufficient supply of electricity to maximize the potential of these villages so that they may be comprehensively sustainable. She is involved in various areas of government policymaking in the electricity sector to further the cause of the marginalized people of Indonesia.